...your Costa Rica Vacation and adventures are waiting! Welcome to Monteverde Tours, Monteverde Costa Rica a premier provider of Costa Rica vacations & travel tours! We’ve been helping people enjoy the amazing country of Costa Rica since 1992, including the breathtaking beauty of Monteverde. 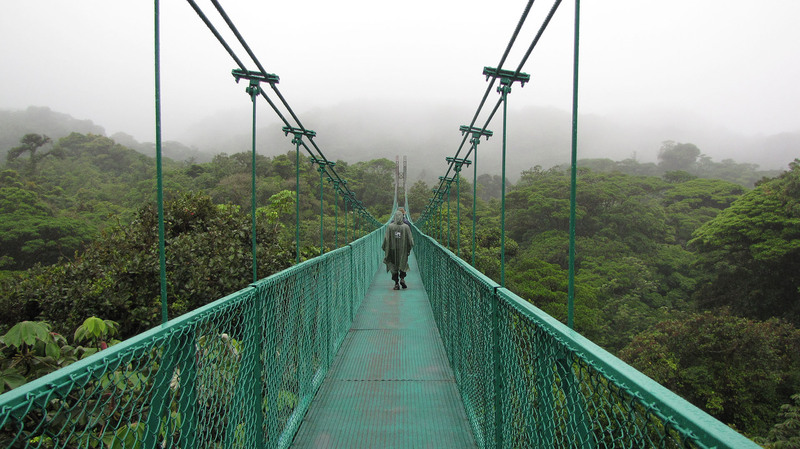 Discover the fascinating ecology of the Monteverde Cloud Forest with Eagle-Eyed Guides! Enjoy a canopy tour, a coffee tour, horseback riding or an exciting bungee jump on the highest bungee jump in Central America. We are not some distant virtual agency, we are located right here in Monteverde and have local experts on our staff. Besides helping you plan your vacation (we know the best spots!) we can organise and advise about tours. Let us help you arrange all your transport. We know the routes and the costs! We can help you find and book the best hotels! We also design complete, custom-made vacation packages to suit you! After all .....everyone is different so every holiday should be different! Saying that, we also have ready made packages waiting for you: no thinking involved! Looking for Tours in Monteverde? Let us help you choose the very best tours. We're here in Monteverde right now! Hotels in Monteverde Costa Rica - info, photos and rates. Hostels, B&B's, economic and deluxe options in Santa Elena and near Monteverde Cloud Forest. Costa Rica Vacation Packages, tailored to suit you. See our exciting ready-made packages. Or book your own hotels we can arrange all tours and transport. Arenal Volcano Tours are our specialty. We organize tours all over Costa Rica, arranging hotels, activities, transport and custom package vacations. Recommended Samara Beach Tours, Transport, Hotels and Information. Samara Costa Rica, or Playa Samara, is located in Guanacaste, just 2 hours away from Liberia one of the major airports in Costa Rica. What Makes Monteverde Tours Service Different & Unique? We’ve been there and done that – literally! We take pride in offering individual attention and custom service. Whatever you seek, we’ll help you find! Feel safe and secure during your adventures! We know all the great areas to see… and which ones to avoid. We can always find out the most up-to-date information about best hotels, activities, adventures and transportationoptions because we are here in the heart of things and can update you as they happen! Everything we suggest for you, we’ve done ourselves (or our friends have tried out!). That gives us unique perspective, and it gives you the kind of hands-on advice that few others can offer.Sure, you could track down every type of tour imaginable on your own, spending hours of time online and on the phone talking to people you’ve never met… but why would you? You have us! We can build a custom adventure just for you, or suggest some of our favorite packages to make the most of your time here in Monteverde Costa Rica as well as other awesome destinations. Amazing. Breathtaking. Rare and beautiful. And we can get you there. The famous cloud forest is located approximately 1440 meters (4700 feet) above sea level. Whatever your style is, we have just the thing for you in the cloud forest area! Bungee Jumping Amazing adventure tour in Monteverde. Highest bungee jump in Central America. Zipline through the treetops on one of our canopy tours! We have the perfect tour formulas for both the mild and the wild - who can resist a zip line in Costa Rica? Hiking for everyone, from general informative tours to all day intensive studies of flora and fauna. Horseback riding offers a fun way to see the gorgeous sights for few hours – or all day! Cultural and Coffee Tours, Monteverde Night Toursand More! What will you find in the Monteverde Cloud Forests? Sights rarely seen – only about 1% of the world’s woodlands have the unique atmosphere and location combinations that create a cloud forest. 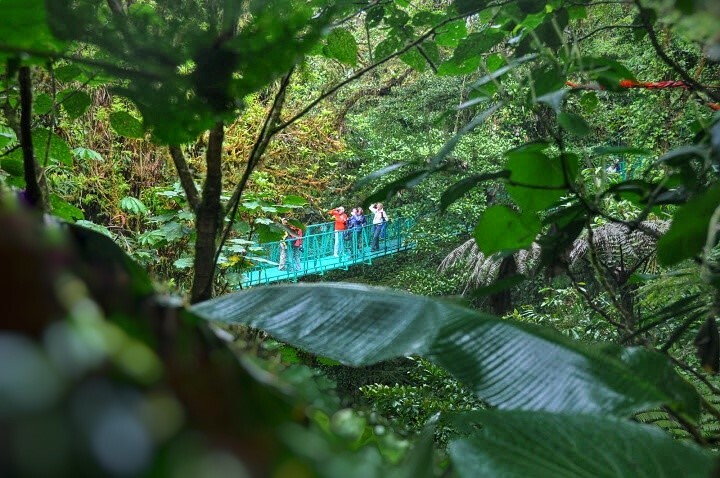 Unbelievable sights of the misty treetops, 100’s of varieties of rare plants and orchids, birds, insects and mammals that thrive in our particularly unique Monteverde Cloud Forest await your wondering eyes. Click here to see our Monteverde Map – and click here to learn more about what a cloud forest is, and why the Monte verde park is so special!